I recently started planting Enigma Seeds on my farm instead of Songbell Seeds. The results are pretty fantastic. 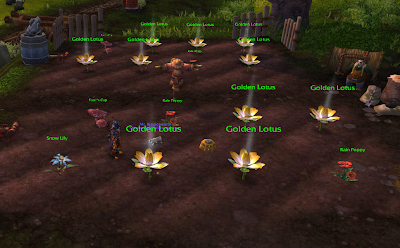 After patch 5.1, the rate at which golden lotus spawns from these seeds have been increased dramatically. On average I see 4-5 Golden Lotus in a plot of 16, today I got pretty lucky with 10. The patch also decreased the exchange rate of Spirit of Harmony(produced by Songbell Seeds) to Golden Lotus from 3 to 2. So unless you're using Spirits of Harmony to craft something, it is way more profitable to use Enigma Seeds, you can transmute gems with Golden Lotus, make flasks or just sell them on the auction house. I really have enjoyed your blog. It would be easier if I didn't have to login to leave a comment, but I digress. Did you know your visited links (I think) are not visible? They are white, and so is your background. thank you for the feedback. I think some links are coming up white because the colors are based on their quality in wow. I'll go ahead and change the background to make it easier to read. I always choose this site for the better information and tips they very nice and very useful to us. Thanks for sharing the best tips and instructions they very help us. You made a good site it's interesting one.